SAN FRANCISCO (KGO) -- Gov. 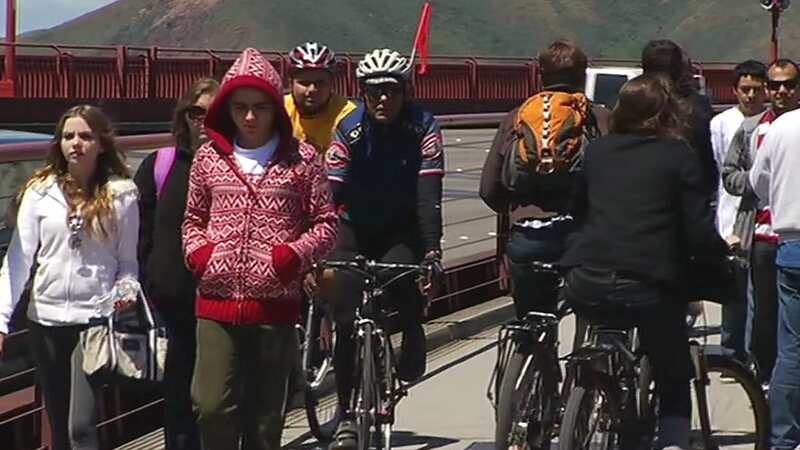 Jerry Brown signed legislation Wednesday by two Bay Area assemblymen prohibiting sidewalk tolls for bicycles and pedestrians on the Golden Gate Bridge. "This is a great victory for our efforts to fight climate change and to preserve access to California's heritage. Finally a bad idea is off the table," said Phil Ting, D-San Francisco. "This legislation continues California's efforts to encourage people to get out of their cars and to walk and bike instead," Marc Levine, D-Marin County said. AB40 was inspired by a recurring proposal to establish the sidewalk toll, Ting said in a news release. The bridge would have become the only contiguous bridge in the country with a sidewalk toll, Ting said. The Golden Gate Bridge Highway and Transportation District voted last year to study the imposition of the sidewalk toll and dozens of other options to eliminate its projected $40 million operating deficit over the next five years. The vehicle toll bridges in the Bay Area include the Golden Gate, Antioch, Benicia-Martinez, Carquinez, Dumbarton and eastern span of the Bay Bridge. None of the bridges have sidewalk tolls for pedestrians and bicyclists. "This bridge is an iconic landmark and must continue to be free for pedestrians and bicyclists from California and from all over the world," Levine said. "No community in the nation has a sidewalk toll," Ting said. "We should not nickel and dime people pursuing healthy transportation alternatives or recreating on our network of parks, paths and trails that we have built around the Bay Area to promote active lifestyles."